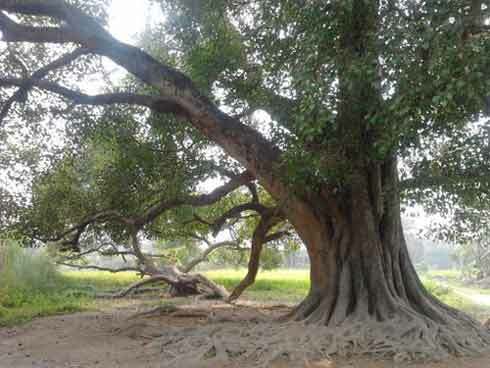 Ashvattha Tree is popularly known as pipal (ficus religiosa), or the sacred fig, and it is of great spiritual and religious importance in Hinduism. It is known as the tree of knowledge and enlightenment. It is the symbolic inverted tree mentioned in Hindu scriptures. Ashvattha Tree is also the seat of gods and abode of the Goddess of wealth. Ashvattha literally means the tree under which the horses stand. As per old beliefs, it was the chariot of Gods. The tree, as per Atharva Veda, is found in the heaven and Devas, or demigods, sat under its shade. The holiness and sanctity of the tree is also mentioned in the Rig Veda. The tree showers soma (the drink of the Gods), as per the Chandogya Upanishad. As per the Rig Veda, the wood of the tree was used to make vessels. The twigs of the tree were used for oblation in the Vedic fire-altar. As per the Puranas, Lord Vishnu resides in the root of the holy tree; Hari lives in the leaves and Achyuta in the fruits. Hari and Achyuta are both forms of Lord Vishnu. The other parts of the tree are occupied by the other Gods. Another belief has it that Brahma resides in the root of the tree, Vishnu in the middle and Shiva at the top. This is why cutting for damaging the tree is prohibited in Hinduism. It is mentioned in the Skanda Purana that the tree is a manifestation of Lord Vishnu and people who have realized its greatness worship it. Ashvattha-Narayana is worshipped in some regions. The tree is a visible form of Narayana. Sixteen kinds of pujas and rituals are offered to the tree. There is a popular legend associating the Ashvattha tree and Agni. Agni was deputed to carry the offerings made by living beings on earth to various Devas. He was not happy with the job and desired to relinquish it. The Devas agreed but requested to continue until person was appointed for the job. Agni was not happy with the decision and he quit the job immediately. The other Devas chased him. He then took the form of a horse and disappeared into a fig tree. It is believed that the tree got the name Ashvattha after it concealed Agni in the form of horse. Ashva in Sanskrit means horse. The tree was held in sacred in all ancient cities in India including Harappa and Mohenjodaro, Sanchi, Bharut, Mathura and Amaravati. The tree is found in pottery, seals, beads and amulets discovered from these ancient cities. Ashvattha Tree is worshipped on Saturdays or Sundays for peace and prosperity in the family. The tree is circumambulated 108 times with folded hands and a thread is wrapped around it by virgins before marriage. The tree is worshipped by couples for healthy children. When a family member dies, 360 pitchers of water is poured on the tree for propitiating the spirits. 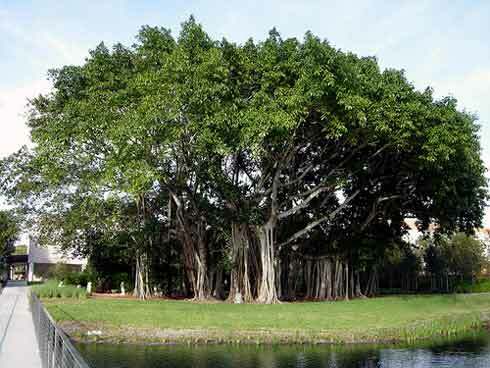 The tree is found in majority of the temples in India. Our forefathers planted the tree in large numbers along important roads and in junctions for shade. Vat Savitri Vrat observed for three days during Jyeshta Purnima and Jyeshta Amavasi is an important fast in Hinduism dedicated to the tree. Some communities observe Ashvattha Vrata in the month of Chaitra (March – April) and Ashwina (September – October). from the tree is used to cure impurity in blood, vomiting, dropsy, excess of phlegm, poisoning, wind and bile, cough, hiccoughs, fever, heart ailments and skin disorders. Sitting under the tree and doing breathing exercise is highly beneficial. The leaves purify the air. Sitting under the tree helps in improving memory power and concentration. Why neem tree and its leaves are associated with Hindu Goddess?